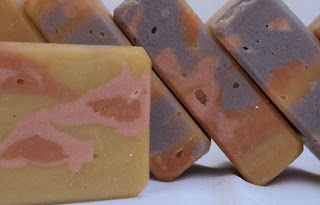 I wanted to create a summer, fruity soap. I made a blend of FO/EOs, the dominant tone was grapefruit. My plan was yellow soap with pink and orange spots, and a purple swirl on the top. I chose one of my regular recipes and prepared a stick-blender as I wanted to secure reaching a thick trace. But as soon as my FO/EO mix touched the bowl my soap seized immediately, I didn´t even have time to get surprised! My first seizure! I wanted to at least colour the soap and to blob it in the mold but the colours didn´t incorporate so I had to HP it - again for the first time! It was one of the FOs for sure, Green Apple is the greatest suspect. 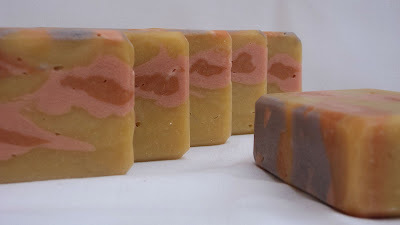 I didn´t know how the scent would hold in the oven, it was very weak so before putting the soap in the mold, I added a little more of this damned Green Apple. After unmolding, my son said it reminded him of something. Yes, it looks like "paté" (I don´t know how to say in English, it´s made from meat and you eat it with bread). 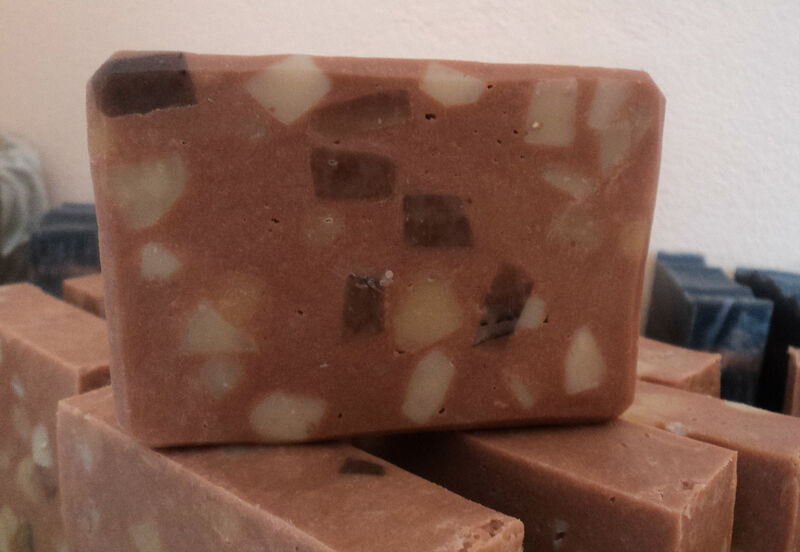 It´s funny that so many soaps turn out to look like a sort of meat! So let´s start again. I had to chose a different scent (obviously not only because I ran out of some FOs). 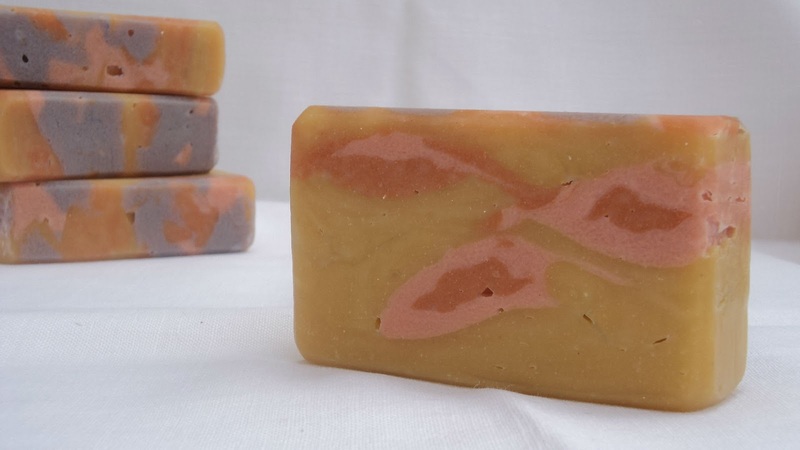 I didn´t give up my idea of fruity soap, so I tried a combo of Watermelon, Cucumber and Lemon, anchored with Cedarwood. This time the trace got thick quite fast as well, but it was manageable. I mixed in the colours and went on the piping. It wasn´t easy at all. I think it is crucial to have thick trace and a good piping bag. With the thick trace I got I had to make a different top, but I like it. 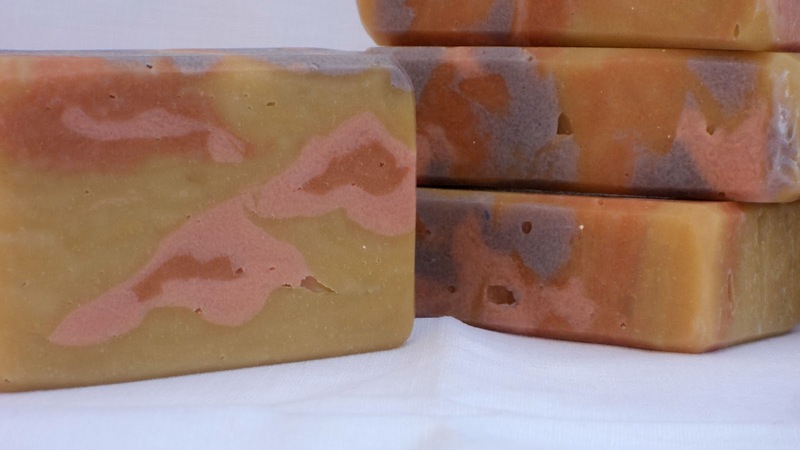 Of course that I got air bubbles, but overall I am pleased with the look, and the scent gets better and better with time. The yellow turned out not as bright as I wanted, but it´s a kind of fruity pineapple yellow and goes well with the fresh scent. Do you want to see the other colourful leopards? You can find them on Great Cakes Soapworks. Thank you Amy for these nice moments! Great job on your leopard spots! I'm so glad you got one to work!! This was my most frustrating & difficult technique as well, so I feel your pain! :) Thank you so much for participating in the challenges, Barbora! !